Back when I was a newbie soapmaker, I made a batch of Nag Champa cold process soap. I added titanium oxide to make it nice and white. My soap smelled marvelous, but I was horrified when it turned dark. I thought I had done something wrong. I didn't know at that time that if a fragrance oil has vanilla in it, the soap that it's in will eventually turn brown. Soap turning brown isn't necessarily a bad thing. With a little preplanning, you can turn soap turning brown into a design advantage. 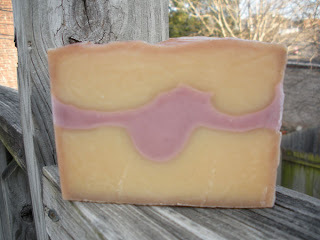 I can make my soap two tone just by adding a fragrance containing vanilla to part of a batch to turn it dark, and omit the fragrance (or add fragrance that doesn't have vanilla in it) from the rest of the batch to color or leave natural. The following pictures show a slice of soap right after cutting where I used the fragrance oil containing vanilla in only of the batch and colored the rest. the second photo shows the same slice of soap after sitting for 1 week. Big difference, isn't it? And kind of a neat look. But, you might wonder, how do I know whether my fragrance oil has vanilla as an ingredient? Some vendors, such as Wholesale Supplies Plus, will actually indicate in their overview for a particular fragrance, whether there is vanilla in it and what percentage. 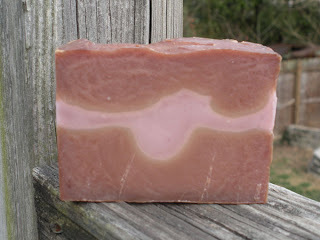 Often, a vendor will mention in the description if the soap will turn brown. Or you can contact your fragrance vendor, most are happy to tell you whether or not your fragrance oil has vanilla in it. In closing, if you don't want your soap to turn brown, do your homework and find out before you make your batch to avoid an unpleasant surprise.